The Type 59 is a Chinese copy of the Soviet M-46 130mm towed field gun (cannon) with some minor modifications. 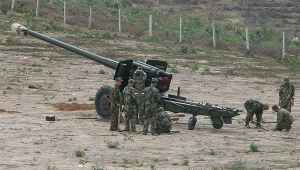 The improved variant Type 59-I with a lighter combat weight has been in service with the PLA ground forces as a standard long-range indirect artillery weapon since 1970. The highly robust and reliable Type 59-I saw actions in conflicts in the Chinese borders and Middle East. 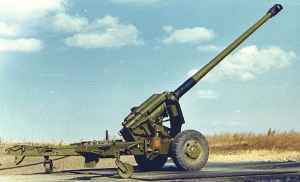 The gun will be replaced by the more capable PLL01 towed 155mm gun-howitzer in the future. 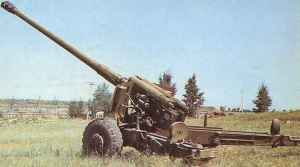 China obtained the technical document and examples of the M-46 130mm towed gun from the Soviet Union in the mid-1950s, and developed its Chinese copy known as Type 59 in 1959. The Chinese design team made certain modifications during its development upon the requests by the PLA, including some features of the Soviet M-47 152mm towed gun. The gun received its design certificate in 1959 and was produced in limited numbers for the PLA in the 1960s. In 1970, the manufacturer introduced an improved variant known as Type 59-I. This version features a modified two-wheel carriage originally developed for the Type 60 122mm towed gun. The modification resulted in the Type 59-I being 2.5 tonnes lighter than the original Soviet M-46 design. The Type 59-I entered service with the PLA in the early 1970s. During the 1979 Sino-Vietnam border conflict, the Type 59-I played a key role in the battle and its performance was highly commended. The Type 59-I was also exported to the Iraqi Army in the 1980s and seen in action during the Iran-Iraq War and the 1990/91 Gulf War. Over 1,000 guns had been produced before the production stopped in the mid-1980s. A significant number of the Type 59-I is till in service with the PLA. 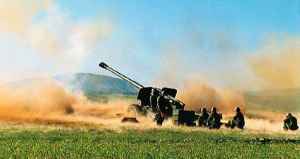 The gun is found in gun battalions of artillery divisions/brigades organic at group army level. These battalions may be assigned to manoeuvre divisions as part of a divisional artillery group. The PLA is considering replacing the Type 59-I and a number of other artillery weapons (Type 60 122mm towed gun, Type 66 152mm towed gun-howitzer, and Type 83 152mm towed gun) with the more capable PLL01 155mm/45-calibre towed gun-howitzer to simplify the logistic supply. A self-propelled version based on a full track chassis was developed but never entered batch production. The Type 59 features a long, thin tube with hydropneumatic recuperator and a recoil cylinder located above and below the tube respectively. The basic variant Type 59 has a perforated (pepperpot-type) muzzle brake, but this was replaced by a large-size double-baffle design on the Type 59-I. The gun has a manually operated horizontal sliding wedge breechblock and fires case-type, variable-charge, separate-loading ammunition. It uses optical direct fire sights for daylight operations and possibly IR/passive night vision for night operations. The Type 59-I is mounted on a two-wheel split trail carriage with large sponge-filled rubber tires. Very limited protection to the crew and ammunitions is provided by a V-shape frontal shield, which is approximately 7mm thick. The Type 59 and Type 59-I fire high-explosive projectile capable of penetrating 250mm of armour set at 0 degree at a range of 1,500m. The gun fires HE rounds at a rate of 7~8 rounds/min (8~10 rounds/min for Type 59-I), with a maximum range of 27km. The gun can also fire illuminating rounds with a maximum range of 25km.